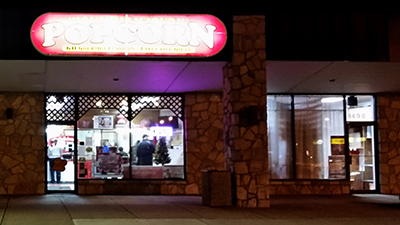 One of the two places is Al’s popcorn with 30 years of experience and now churning out over 60 flavors of the “vegetable?”. Yeah, I’m counting it as a vegetable. 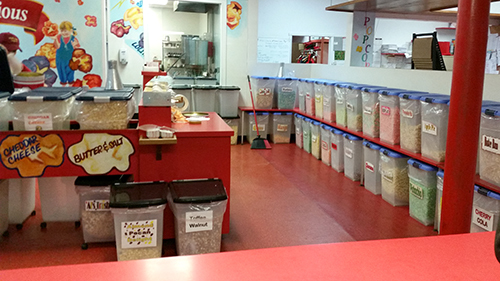 Bins and bins fill the room behind the counter and there is a dude in back mixing new batches. Since my introduction to Garrett’s in Chicago I’ve been more inclined to get a bag somewhere beside the movie theater. 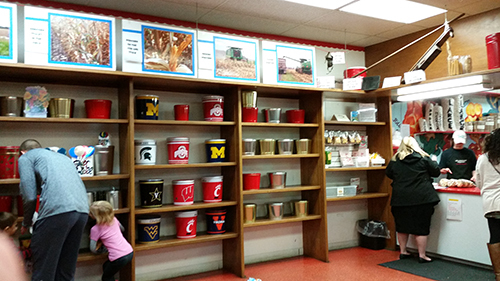 There are a number of folks behind the counter filling tins and bags, all of whom seem personable and eager to serve their customers. That’s a big part of getting to 30 years. The other part is the popcorn. They smartly bring you samples of anything you are interested in, that’s how I ended up with a bag of something I would never order. It’s also how I’ve ended up craving it since. Go Bucs! Jelly Bean? Really? 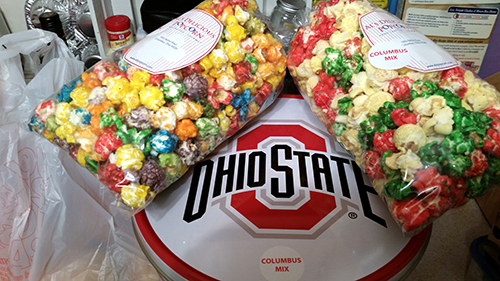 After getting a healthy tin of Columbus Mix for my business partner (vanilla butternut and white cheddar mixed) in an Ohio State branded bucket (cause Michigan fans need something good in their lives). We got our own little bag of the C-bus Mix which is tasty. I will remain a Chicago mix kinda guy though. The vanilla was nice but not quite caramel and I don’t know what it is, but every time I get white cheddar it never delivers the salty awesomeness of the yellow stuff. Good, but still should have gotten a bag of their Chicago to see. 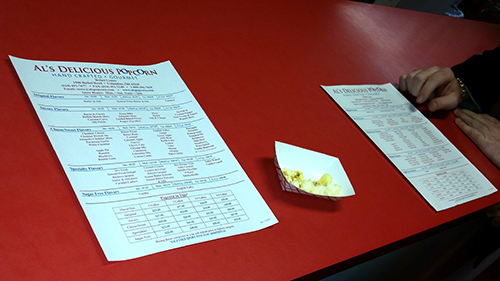 We were trying some other flavors and I wondered aloud…what in the world does watermelon popcorn taste like? A sample appeared. It tastes like popcorn wrapped in Jolly Rancher. I should have hated it. I looked up and saw a bin labeled Jelly Bean. I was informed it was a mix of all of their fruit flavors. Me likey. Want more. Far away. We’ll be back.